We are a leading Manufacturer of ph regulator with indicator and ksharda ph regular with indicator from Nashik, India. 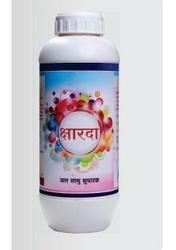 Ksharada is a Scientific Water Conditioner. The good quality of water is required for application of fertilizers insecticide for their proper results. Generally water with pH value in between 5.5 – 6.5 used gives better results for all type of foliar soil applications. Ksharada is a scientifically prepared buffered conditioner.So it helps in improvement of results of agrochemicals / nutrients applied to the crops.Ksharadaenhances the solubility of combinations of more than one ingredient to be used for spraying,.Ksharada protects the ingredients from precipitating by preventing the formation of insoluble complexes. Ksharada keeps solution stable for a longer period of time. Ksharada also controls the electric conductivity of water by complexing the salts of chlorides which are harmful to the crops. Ksharada is recommended for all type of water like Bore well, Well, River, Natural reservoirs which is used for spraying drip applications. Compatibility :-Ksharda is compatible with all types of insecticides fertilizers.